To view all of my photos from Saturday, click here. It was short, it was kinda sweet. 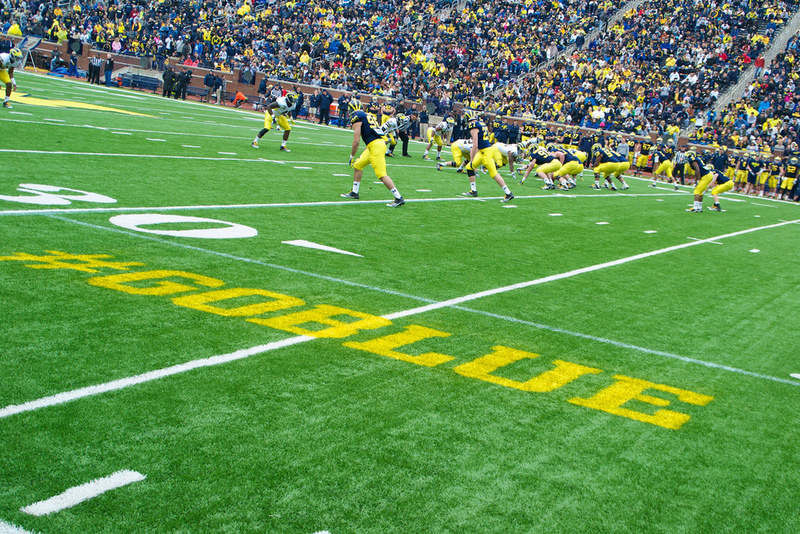 All in all it was exactly what a typical Michigan spring game is. There were quite a few things to take notice of, so let's jump into some bullets. • The interior of the DL was called out by Brady Hoke at the presser following the scrimmage...says we're still too soft there. And while its tough to gauge such things on television or from the press box, I'd say I'm not surprised given the departure of Mike Martin and RVB. But Coach Mattison did mention that the move of Jibreel Black (to the 3-technique) and Craig Roh to the strong-side end have been great moves this off-season. A lot of attention was paid Saturday to Will Campbell, and from what I saw and what I heard, he's really beginning to step up at the nose. He saw a lot of time on the field Saturday with both the first and second strings. And given how high coach Mattison is on him, I'd say by September 1st, he should be good to go. Keith Heitzman had a big day. It may just be one of those things when a guy just has a really good day, but it is encouraging to see. Mattison was high on him, but noted that he does need to get a lot stronger and work on his technique. • Staying with the defense, I thought LBs looked about as good as they have in a spring game in a long time. Some of that is just having better athletes at these positions, but the real benefit is having these guys being in the same defense for a second year in a row...a first for most of them. I think we really saw this with guys like Demens, who's competing with Bolden for the MLB spot, but will likely be shifted to the WILL before too long. He, Ryan, Morgan (before he got hurt, hamstring I heard). Brandin Hawthorne is in the mix, but needs to be better consistently. • I'll mention the DBs, but I don't really think we have a lot to discuss right now. Countess had a nice day with an INT, capped off a very good spring for him. Kovacs is...Kovacs. He, Campbell and Demens are the senior leaders of this defense. I think Marvin Robinson had a really nice day. Overall not too concerned about this group. Mattison never mentioned anyone in the presser other than Blake. He did mention that they need to improve as a group at getting better with blitzing...getting more pressure on the QB. • Devin Garnder is just not good at spring games. That's all there is to it. For some reason, he regresses terribly in front of a spring crowd. He saw a lot of snaps on Saturday, and I would say he left everyone with a pretty bad taste in their mouth. He paled in comparison to sophomore Russell Bellomy, who also saw a lot of time at QB. Russell showed he knows this offense pretty well and he will keep Garnder on his toes for the #2 spot. Brady Hoke said in the presser that Devin is still the backup for Denard, but I have to think it's gotta be a little bit closer after Saturday. I think Devin keeps his spot because he still does have a pretty good arm, and in normal game scenarios he plays pretty well. He has experience and better overall athletic ability – ability that is closer to Denard than Bellomy has. So if Denard goes down, I don't think the playbook changes that much if Devin comes in as opposed to Bellomy. But that's just my $0.02. So, basically, it's all about developing the experience. • We have a nice stable of running backs, and leading the way is, of course, Fitz. He had a nice day, and a nice spring as a whole. Rawls impressed as well. Shows that he can hit the hole hard and doesn't mind some contact. Made a few guys miss too. I think Vincent Smith, who Hoke said is pound-for-pound the strongest guy on the team, is still going to be a major part of this offense in many ways. I think catching the ball out of the backfield could be one of his biggest strengths. • The OL coming together. Borges is really happy with Barnum at center, and so am I. Let's face it, no one is going to replace David Molk. But if we can get a guy in there who is smart enough to understand the offense and be a leader, as well as a good blocker, than I think we're going to just fine with Barnum. No issues at tackles with Lewan and Schofield. Surprising me was Burzynski starting, although he's really not starting. But he's pushing guys, which is good because we need some depth on the OL. Mealer was lining up at RT for the second string. • Receivers were pretty much absent from this game. They didn't get a lot of throws their way so there's not much to talk about. Gallon has some nice grabs. I think Roundtree caught a couple slants. All in all, I think this group is fine, Jerald Robinson was a little banged up but it's nothing serious. He could be a real standout this year, I have a feeling. 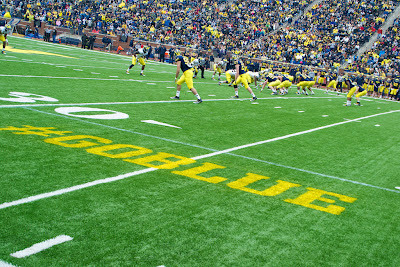 Dileo and Jackson looked pretty good out there at the slot. More depth would be nice, but it's still just spring and a lot of young talent is still yet to arrive on campus for next year. I think a lot of things change when that happens this summer at a lot of positions. • Finally, TEs were pretty rough on Saturday. Moore saw most of the time with the starters, but like the receivers, didn't get much attention. This position is still very much up in the air.